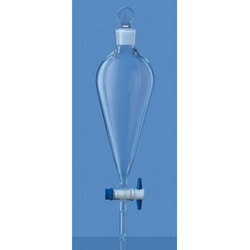 We offer Funnel cylinderical from 50 ml to 2000 mls. Polylab seperatory funnel is made of polypropylene, giving it excellent contact clarity and strength. This pear shaped, autoclavable separating funnel has a leak proof threaded screw cap. The polypropylene stopcock, fitted with a self lubricating PTFE plug, is push fitted to the stem of the seperatory funnel. With the involvement of modish technology, latest machinery and advanced tools in all our processes, we are occupied in offering Separating Funnel. Keeping the diverse requirements of customers in mind, we are instrumental in providing Separatory Funnel. Pressure Equalising Funnels, Cylindrical, with Socket & PTFE Key Stopcock and stem with cone. 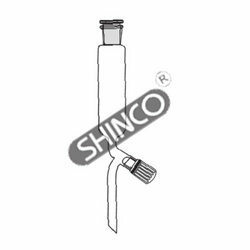 Being one of the leading companies, we also manufacture and export a quality range of Separation Funnel all around the world. It is fabricated from low expansion Borosilicate type and is highly durable in nature. These funnels consist of a stopper and are available Cylindrical Open Top with cone and with socket and cone.